For a year we lived in our nice new home with a small set of temporary steps to the front entrance. It was functional but not comfortable or appealing but we waited for the ground to settle at the suggestion of our builder. This spring we contacted a few local masons soliciting estimates for some kind of stonework steps. Only one bothered to get back to us but he turned out to be the right guy anyway. Kevin Reilly, of Kevin Reilly Masonry, looked over our situation and suggested a solution that had not occurred to us: stack two large stones as steps, and forget about building some kind of mortared stone steps. This had a few advantages: it didn’t require footers, it can be adjusted later if there’s any substantial settling, it’s a clean and simple look, and it was not as labor-intensive for Kevin (which was important as he was already booked with work for the season). 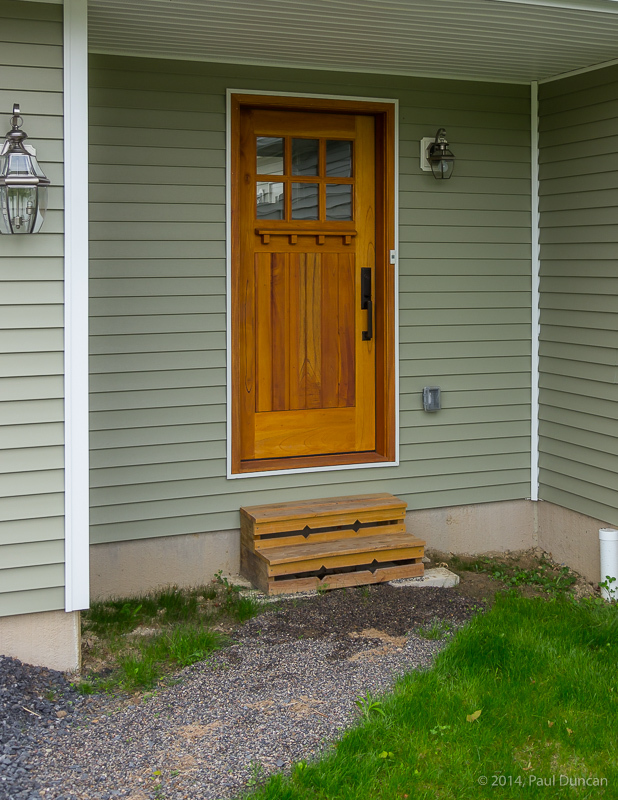 After measuring and ordering the stones, Kevin and his crew prepared a gravel base at just the right height to make the steps an easy and natural progression to the door. Somehow they slipped the bottom stone into place with about 1/4 inch to spare and without dinging the siding. The slab was 10 feet wide, 4 feet deep, and weighed almost 3,000 pounds and it fits like a glove into the entrance recess. Imagine slipping a Buick into a refrigerator carton without dimpling the cardboard–we wish we were here to see how they managed it. 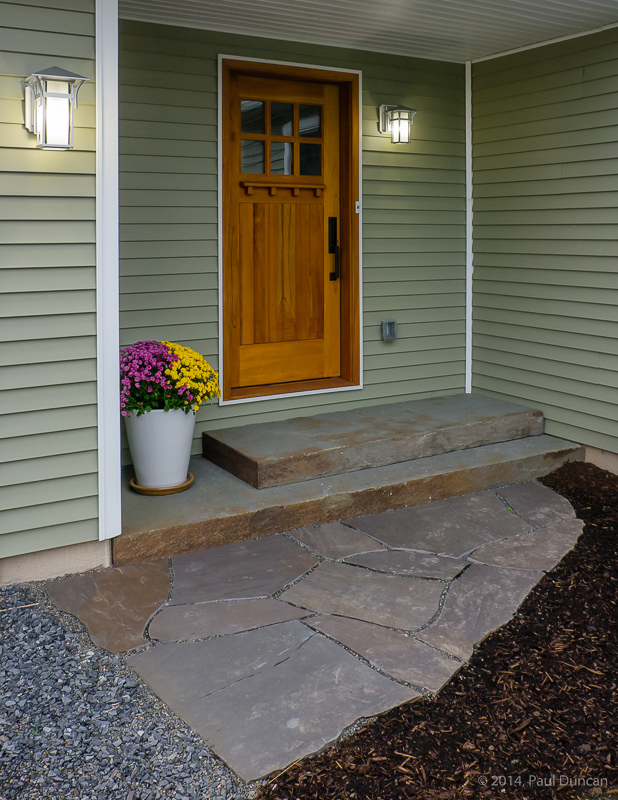 The top stone was positioned into place and then they added a flagstone walk from the driveway to the steps. We love the look. Earlier we had changed out the front exterior lights including next to the door, and later we started our landscaping. All contribute to a transformed front entrance that we’re quite happy with. Newfield, a mostly quiet, formerly farming community, is undergoing some changes as demographics shift and new residents move in. In some cases they bring new ideas and innovations, including in home construction. Here’s one example. Challenging old stereotypes, the owner clearly questioned the rationale for having a horizontal floor. The steep slope of the property begs for a reinterpretation of floor orientation. There are, of course, some challenges. 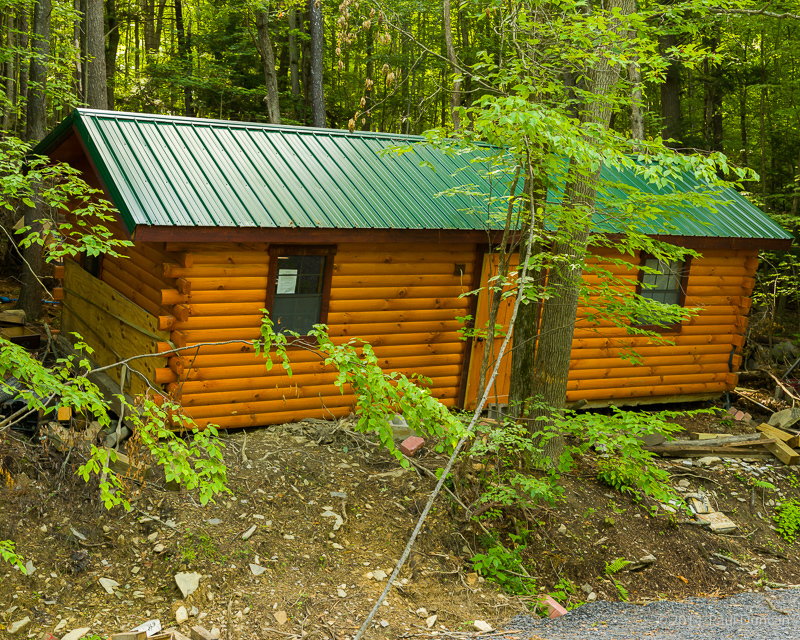 The cabin rests on the sloped ground with no foundation beneath. 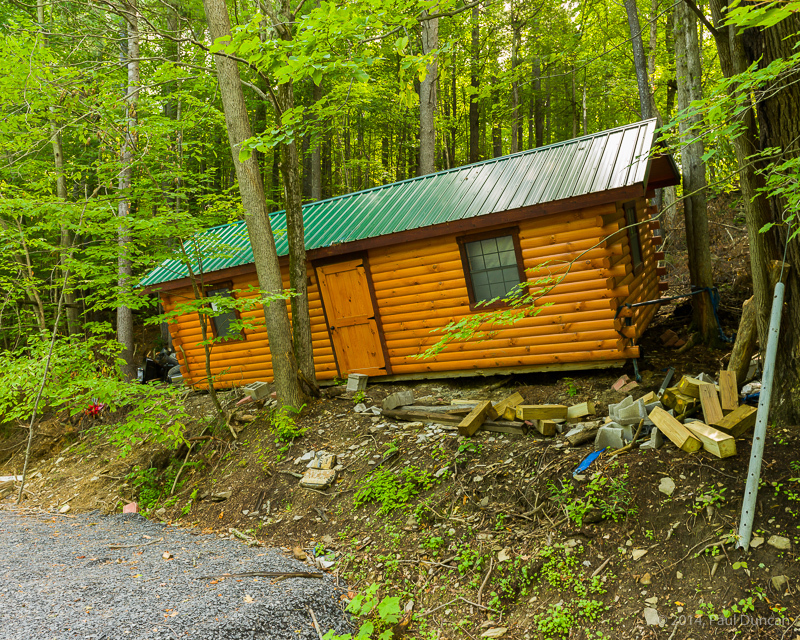 Since the cabin was wrestled from the road up into the woods, it’s slid down a bit, probably during some of the torrential rains we’ve had recently. You can see the divot in the front of the roof when the cabin slid down in contact with a large tree in front of the door. New problems provoke clever solutions. Heavy duty straps are looped around the protruding log wall ends and anchored around up-slope trees–that should keep the house in place. Surely the tension on the straps won’t compromise the integrity of the logs they’re wrapped around. Genius. You would think this kind of creative thinking and reinterpretation of tired old building conventions would be celebrated. Sadly, this effort has been rewarded with a stop-work injunction fastened to a window on the cabin. Who knows what the local building code authority objected to; it was likely the missing light fixture next to the front door or something similarly benign. We salute you, home builder. You think outside the (downhill-sliding) box. As we mark our first year living in our new home, we also have a year’s worth of data on how our geothermal heating and cooling system has performed. Subjectively, the answer is “great” with ample heat in the winter and air conditioning in the summer. We’re always comfortable and the air is not as dry as furnace-processed air. A big test, though, is how it performs financially. Geothermal systems are more expensive to install than more common systems. The expectation is that the extra up-front cost is compensated by much lower operating cost. We were eager to find out. Our system provides some basic historic performance data that are useful in estimating use costs. We can get monthly summaries of kilowatt hours (KWH) used by the system for heating, KWH used for cooling, and how many hours the system has been running. The system does not report the power consumed by the motors driving the pumps for the ground loops. There are two 245-watt motors and, for the sake of guesstimation, we’ll assume they’re running when the heat pump is running, enabling us to estimate the pump KWH consumption. Graphically, we get a better idea of electric consumption throughout the year. There’s the obvious increase during the winter months and a lesser increase during the summer cooling season. The system reported a total of 343.2 KWH used for cooling for the year, 2701.6 KWH used for heating, and an estimated 1377.0 KWH were used by the ground loop pumps. 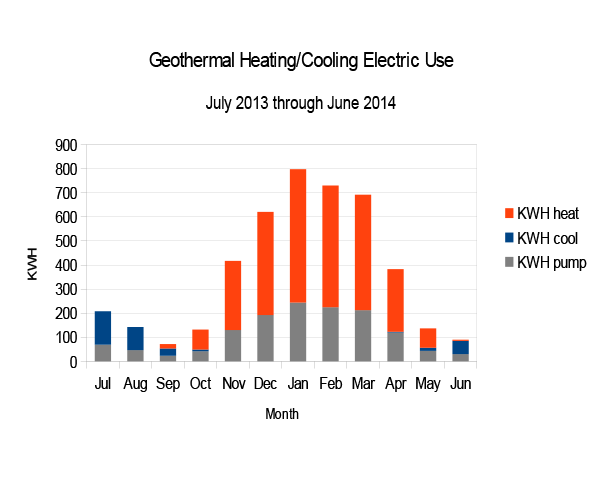 The grand total for heating and cooling for a year: 4421.8 KWH. Last I looked we were paying about 13 cents per delivered KWH on our electric bill so, we can estimate we paid about $575 for the year for heating and cooling. Not too shabby. We had a really cold winter in the northeast. To estimate the costs of heating and cooling during more “normal” seasons, we can use heating and cooling degree day (HDD and CDD) data for our area to help estimate what the costs would have been in previous years. I looked up the relevant degree-day numbers for the 12-month period we used our system and the 2 previous 12-month periods before that. Heating and cooling requirements for a building are proportional to the degree-day demands imposed on the system so, based on our year’s worth of data, we can estimate costs for the previous 2 years. Each of the 2 previous years had warmer winters but also warmer summers so more AC would have been required. But still, those 2 previous years would have been less demanding and less expensive than our year because of the frigid winter we had. It looks like we’re going to spend somewhere in the vicinity of $500 to $600 per year for heating and cooling based on current delivered electricity rates here. Our geothermal heat pump has a Coefficient of Performance (COP) of 4.0 to 4.6 for the ground loop system we have. Some back-of-the-envelope scribbling indicates that we would be paying 3 to 5 times what we are now for other conventional types of heating and cooling systems available in our area. We’ll be somewhat protected from the volatility in the propane and heating oil markets as well, although there have been some spikes in electric costs in some areas. We recently completed installation of our deck cable railing, which was designed and fabricated by Keuka Studios, making us street-legal and building-code-compliant. We didn’t like the idea of maintenance headaches for the typical pressure-treated lumber railings. We’ve had experience power-washing and staining them and it’s no picnic. After looking at options, we decided on the nice clean look of stainless steel cable railings with low maintenance and minimal visual obstruction. We provided the measurements to Keuka Studios and they fabricated the powder-coated steel posts, sapele wood top railing (similar to mahogany), and provided all the cables and fittings necessary to install it. I was able to install it myself without any major problems and we really like the final result–it’s just what we were hoping for. Ours is what Keuka Studios calls their Ithaca style, characterized by clean simple lines. They build other styles as well to any custom specifications. As much as we like the end result, our project was riddled with screw-ups by Keuka Studios. They built and shipped the railing system within the quoted time but there were a couple problems: 2 of the 10 intermediate posts were missing the grommets used to mitigate corrosion between the metal of cable and posts, and they forgot the wood top railing. Within a week they shipped the wood for the top railing but to the wrong address and provided an obsolete phone number to the shipper to contact us. Eventually the trucking company contacted me by email and we discovered the addressing screw-up and they contacted Keuka Studios to authorize shipment to the correct address. After another week I found out they hadn’t done this and we tried again. Eventually Keuka Studios authorized the correct address but still gave the wrong phone number so the dispatcher was never able to contact me. Meanwhile, after a couple requests, Keuka Studios mailed out the missing grommets, but to the wrong address so I never got them. After another attempt, they finally sent them to the correct address and the top railing wood eventually showed up on a tractor trailer one afternoon. Maybe Keuka Studios packed all their screw-ups for the year into their dealings with me, saving others similar issues. I would hate to think this is a common theme for their customers. They have a very nice product, well-made, and they eventually made everything right but it sure got frustrating getting everything straightened out. Neighbors recently visited our new home with a welcome basket full of garden goodies, wine, and, the pièce de résistance, a work of fine art. While the sculpture stands on its own, a little context will explain why it has added profound meaning for me. A long time ago, I posted a parody on Flickr which this neighbor stumbled upon and found amusing to the point of wondering if perhaps I wasn’t the purported most boring man in the world after all. At any rate, the banana theme has played out a few times culminating with this extraordinary and thoughtful gift. Surprisingly, the work has caused some amount of fervid discussion between Lori and me. I, of course, wish to proudly display the art in our living area to share with family, friends, and neighbors. Lori insists that, since the work was intended for me, it should be in my office, not the main living area. I’m touched that she is so considerate that she wants me to have almost sole appreciation for this stunning piece. She seems quite concerned when visitors arrive, fearing they may see the sculpture as we offer tours of our new home. She suggests it be boxed up and in the closet. Clearly Lori is deeply concerned about this valuable piece and fears it may be damaged by admirers. What a considerate wife she is! I try to assure her that we may safely display our art work and she keeps assuring me I should be the exclusive beneficiary of its beauty and inspiration. I’m speechless. Almost. Normally I would, of course, name the profoundly thoughtful person who has so moved us with this magnificent piece. However, he is an estimable person of high-ranking position in our town and, realizing not everybody in this town shares the sophisticated appreciation of fine art that we do, it is best that we simply say that he is a valued and thoughtful friend. ≈ Comments Off on House Progress: We’re In! We’re moved! Well, almost. But close enough that we spent our first night in the new house. We had a superb crew of young guys show up and do the heavy lifting during 95-degree weather to get the big stuff moved from Owego to Newfield. (If we were moving in Melbourne Australia we would have, of course, called Man With A Van for our move. *) We just have a few smaller things left to bring over during the week. Our biggest impression of the house so far: wow is it quiet. Our 2 cats complained the whole trip over to their new home but rather quickly decided it was pretty darned nice. Now comes the daunting task of sorting through the mounds and making organizational sense of them. * Uncharacteristic blatant plug because, well, I was asked politely and I like their Web site. Updates have been sparse lately, due primarily to a dead computer, but I’m back. In a nutshell, the house is nearly done. In fact, it’s so nearly done, we have a temporary CO (Certificate of Occupancy from the Newfield building inspector) meaning we essentially can move in. The CO will become permanent once the finish grading, seeding, and mulching are done. Meanwhile, we had Cortland Floorcraft in to create a tile back splash in the kitchen and to put in a ceramic tile floor in the entrance. A local husband/wife team came in and did an outstanding job installing the carpet in bedrooms and loft; they did a very neat and tidy job in miserably hot conditions. Matt finished a long list of chores and will be back when we get our deck railing to finish the last few remaining details. We have even started moving. 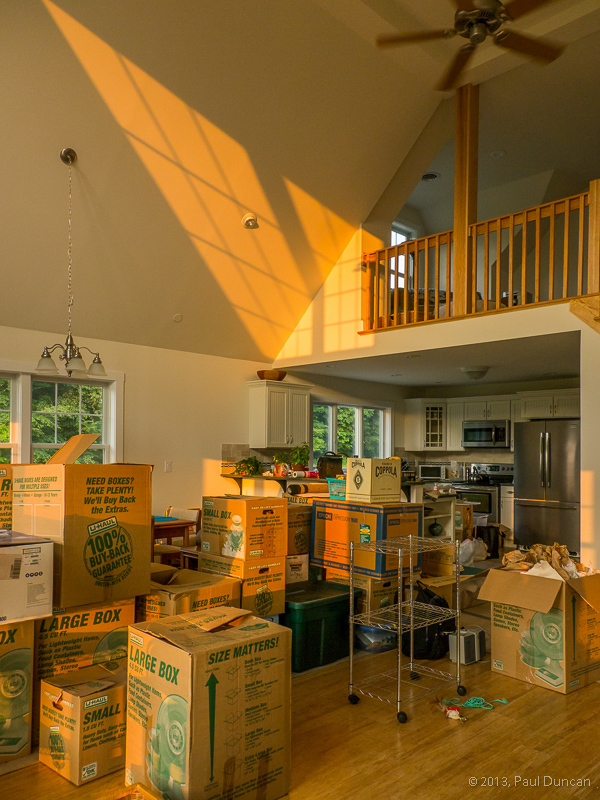 We’re hauling loose or delicate items and leaving the big moving fundamentals for later this month when we rent a truck and hire some help to finish the job. Some time after everything settles, we’ll do some post-mortem on how this whole project worked. We had some disappointments and made some mistakes but we’re ending up with a house that we’re very happy with and we want to give credit where credit is due. And we’ll talk about Time Warner. Our house is nearly complete! It’s been a very busy couple of weeks, both for us and for our builder, Matt. Our sand-filter septic system was installed, plumbing hooked up, a large robust deck built along the east (back) side of the house, ceramic tile backsplash installed, driveway installed, preliminary grading complete, and a slew of other jobs completed. There are only a few items left to do before we start moving in. First we have to get past the Certificate of Occupancy inspection and water tests. Lori and I continue to chip away at patching, painting, and whatever else we can do to move things along. We pulled 220 feet of coax cable through buried conduit over the Memorial Day weekend. It was a bit dicey but persistent stubbornness got the job done. My computer has died, along with my ability to process images so a comprehensive set of final photos will have to wait until the new system arrives around June 10. Ever onward! Another week has gone by without our builder. We’ve made good progress on a few fronts anyway. All doors and windows have been painted (at least all that we wanted to paint before we move in). This week we also installed all the kitchen cabinet handles and pulls. That was a bit nerve wracking because Lori decidedly did not want any extra ventilation holes in the doors and drawers which meant I had to do it right the first time. That’s not my customary way of operating but I managed to pull it off anyway. Everything is where it should be with no extra holes. There are only a few items to get done before we move in. Things like install a septic system, hook up all the plumbing, install flooring, build a deck, build front steps, etc.. How long can any of that take? We’ll be done in no time.